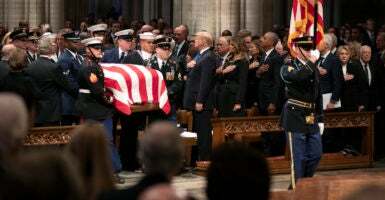 The body of the 41st president will be flown back to Houston to lie in repose at St. Martin’s Episcopal Church before a private funeral service there Thursday. A train then will carry the casket 97 miles northwest to the George H.W. Bush Presidential Library and Museum at Texas A&M University in College Station, for the former president’s burial alongside Barbara Bush and their daughter Robin.